Today’s Nice Price or Crack Pipe Cobra is claimed in its ad to be supercharged, but there’s no evidence of it being blown in the provided pics. Could that potential mistake make its price an even bigger one? In life, there are certain warning signs that alert us to danger. There’s the Rattlesnake’s eponymous rattle, poison ivy’s ‘leaves of three’ and any girl describing herself as a ‘hot mess.’ All of these are indications to stay away. You can probably add to that any car that has had a major component—like a transmission—fail within 100K of life. That may mean that it’s a simply cursed model, or that it’s spent its life being wrung out, which may indicate that everything else is going to be all a jangle. That was potentially the case with yesterday’s 2013 Fiat 500 Abarth, which rocked a new set of cogs, but also exhibited other additions that may have added to the uncertainty of its prospects. That fact was not lost on the majority of you who viewed its $7,500 asking price with skepticism and eventually with a 66 percent Crack Pipe vote. Seeing as we’re on a bit of a roll so far this week with modded cars, let’s let it ride with today’s candidate, an extravagantly over the top 1997 Ford Mustang Cobra. It’s out of—you guessed it—Florida. Now, we considered a ’97 Cobra not that long ago, and that Shinoda branded beast was looked down upon both for its expressive decals and its five-figure price. This one comes in at nearly half that one’s asking, and a hell of a lot more attention-grabbing bodywork. Without forced induction, the DOHC SVT engine is still good for a healthy 305 horsepower and 300 lb-ft of torque. A T-45 five-speed backs that up and sends power back to a solid rear axle with Trac-Lok limited slip diff. Sadly, the build plaque is missing from this 4.6 so we don’t know who to thank for work done in its assembly. A triangulated strut stiffener has been added to the engine bay, perhaps as consolation, but it’s just not the same. Of course, you might not even pop the hood when confronted by the custom body work. That’s a Vader kit from Durflex and it goes all the way around with sculpted side skirts, a rear valance, and a nose that adds a good foot to the car’s length and is only slightly less garish than that of BMW’s new 3-series. The orange paint is countered by a pair of bold center stripes. As long as you don’t mind the ostentation it all looks to be perfectly serviceable if admittedly pedestrian un-friendly. On the downside, there looks to be some window tint on the rear glass that’s giving up the ghost. That’s a pain in the neck to remove. The interior come across a little less successful than the exterior, with orange and biscuit trim and a good bit of wear apparent on the driver’s seat. Another issue here is the total lack of expected A-pillar gauges. A stock stereo presents in the dash and only 50,000 mile show on the odometer. The dealer offering the car doesn’t give us much to go on in the ad. They say the car is in “GREAT CONDITION” and that it has “LOTS OF CUSTOM WORK” which you “MUST SEE!! !” Also noted is a clean title and that specious claim that the engine is supercharged. As we can’t see the entire engine bay we’ll have to take that last declaration with a grain of salt. What we can see of the mill doesn’t show any evidence of either Roots or Paxton style blowers. Consider that while also considering the car’s $7,950 asking price. In fact, it’s now time to put that and the car to a vote. 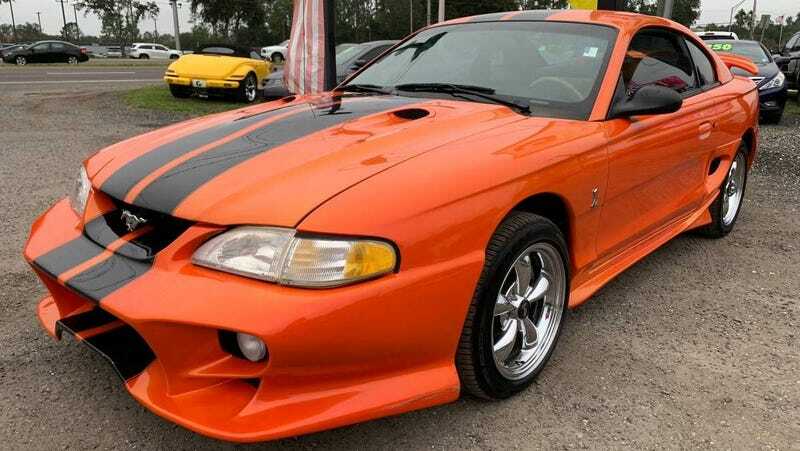 What do you think, is this Mustang Cobra worth that $7,950 asking? Or, is that price as over the top as the bodywork? Jacksonville, FL Craigslist, or go here if the ad disappears.